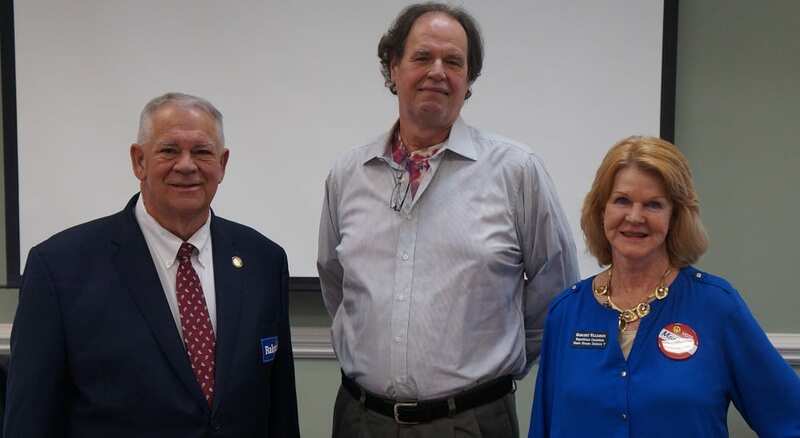 ELLIJAY, Ga. – The Gilmer County Chamber of Commerce hosted a forum to meet the candidates in Gilmer’s two major elections this year. First, the Post 2 County Commissioner race saw candidates Karleen Ferguson, Woody Janssen, and Jerry Tuso speak about Gilmer specifically and their own lives and qualifications while 7th District State Representative candidates Rick Day, David Ralston, and Margaret Williamson spoke more generally on Gilmer’s place in the state as a whole and their role as a representative. Hosted by Gilmer Chamber President and Chief Executive Officer (CEO) Paige Green and Board of Directors Chairman Trent Sanford, the event gave five minutes to each candidate to offer their words to citizens before allowing for time for citizens to mingle and speak face-to-face with them and ask their own questions. The event kicked off with the candidates for Gilmer County Post 2 Commissioner. Jerry Tuso, candidate for Gilmer County Post 2 Commissioner. 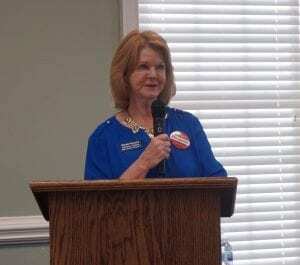 Karleen Ferguson, candidate for Gilmer County Post 2 Commissioner. Woody Janssen, candidate for Gilmer County Post 2 Commissioner. With that, the night’s events turned towards the District 7 State Representative election. Rick Day, candidate for Georgia District 7 Representative. It is the quiet desperation that Day said he wants to address. He wants to represent them and increase the economy and growth for all those in the county to answer the “quiet desperation.” Day said the way he intends to pay for that growth and that answer is by adopting the Colorado approach by legalizing cannabis. Day likened the agricultural growth in our region with vineyards to a bridge, saying the next step with cannabis is a massive economic impact and job growth waiting to happen in our region. 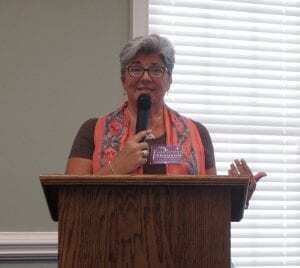 Margaret Williamson, candidate for Georgia District 7 Representative. Second to speak was Margaret Williamson. Williamson’s background comes from engineering, marketing, and business administration. However, it was her time at home with her children and supporting her husband that Williamson said allowed her the time to become more active in volunteering in the community. This time in our community is what she said gives her the “pulse of the things that are going on in District 7.” She told a story about visiting Abby’s, a local business, for ice cream and frozen yogurt with her grandchildren. As she sat watching them pile as many sprinkles on their ice cream as they could, Williamson said she realized that was the biggest issue for them. She asked herself what their future in our district was? Utilizing our resources, Williamson said we have enough to attract more of smaller, low impact businesses that offer better-paying jobs with advancement. She went on to note that she is running for the position to offer real representation from someone who cares, will work for the people, and will be honest about legislation and how it will affect the people. Williamson said she wants to change the office to be more present in the district besides just for “photo ops” as well as adding a weekly event in the district during session so that citizens can speak to her about legislation and concerns in the state. David Ralston, candidate for Georgia District 7 Representative. The final candidate to speak was Georgia Speaker of the House David Ralston. Ralston was born and raised in Gilmer County where he graduated high school. Ralston said it was the community’s help that achieved his successes like $550,000 for the “long overdue completion” of the Clear Creek Ball Fields, $150,000 for the Gilmer County Playhouse, $310,000 for equipping the Gilmer Canning Plant, $250,000 for repairs and renovations to the Gilmer County Library, $283,000 in state funds for improvements to the River Park, and $1,2 million for expansion of the Gilmer County Water System. Ralston also noted the recent legislative session as the most successful in recent memory. The first cut to the state income tax in history, the ending of austerity cuts to local education in Georgia, and the first reform to Georgia’s adoption law in 30 years were the major points that he utilized to exemplify that success. Ralston noted that despite the successes, there is more work to be done. 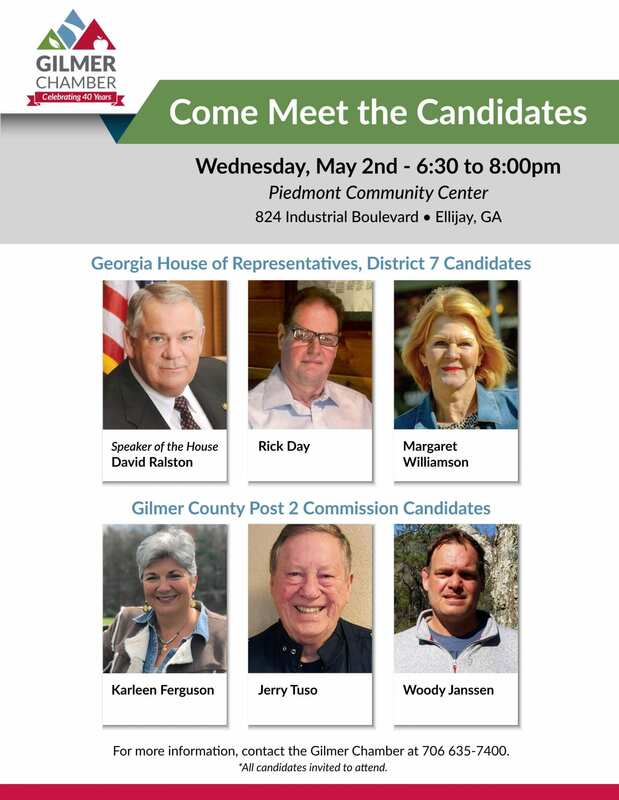 EAST ELLIJAY, Ga. – The Gilmer Chamber has officially announced an opportunity for county citizens to meet with the candidates from the two major elections in our county May 2. As the only two races with competition, citizens will walk and talk with candidates from the local Post 2 Commissioner election as well as the District 7 candidates for the Georgia State House of Representatives. Candidates for Post 2 Commissioner include Karleen Ferguson, Jerry Tuso, and Woody Janssen. There is no incumbent in this race. Candidates for House of Representatives District 7 include David Ralston, Rick Day, and Margaret Williamson. Speaker of the House David Ralston is the incumbent in this race. Scheduled for Wednesday, May 2, at 6:30 pm, the event will last two hours. Find more information with the Chamber’s flier for the event below. 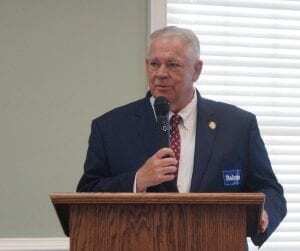 ELLIJAY, Ga. – FetchYourNews (FYN) has confirmed with the Gilmer County Probate Court that Danny Hall has removed his name from the Post 2 Commissioner ballot. 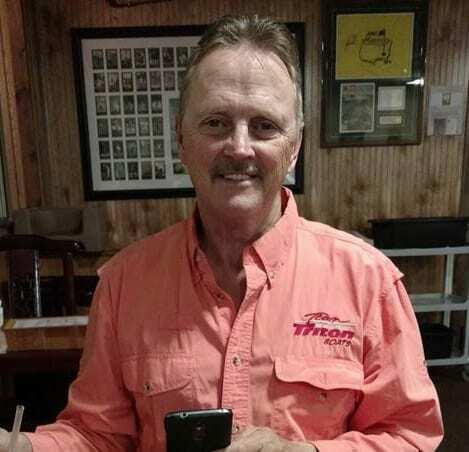 Tammy Watkins from the Gilmer County Probate Court confirmed with FYN that the official paperwork has been filed to remove him from the race. However, the name will still appear on the ballots in the election. According to Watkins, there will be notes in the election booths about his retirement from the race. It is the current understanding that the official reason for Hall backing out of the race is due to work scheduling conflicts that he said would detriment his service to the county. Hall stated that the conflicts would not allow him to make a full commitment to the position. With only the official statement available, stay with FYN as we seek more details from Hall in the coming days. 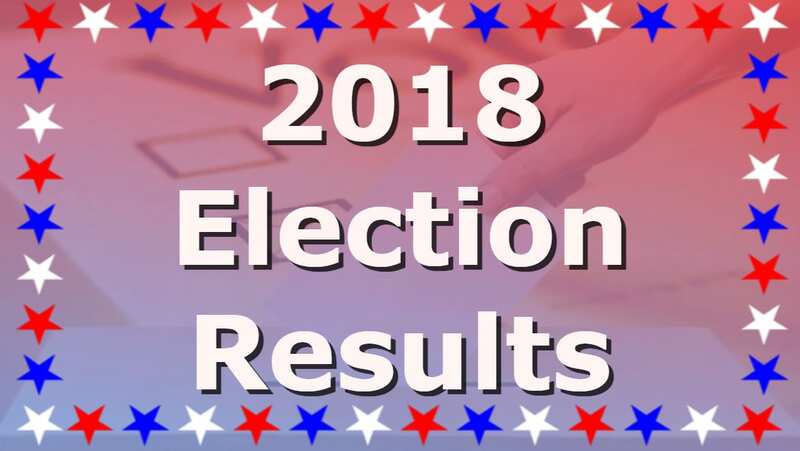 Hall’s withdrawal from the election leaves three other candidates in the race: Karleen Ferguson, Jerry Tuso, and Woody Janssen. ELLIJAY, Ga. – Having put in his qualification to run for the position of Gilmer County Post 2 Commissioner, G.R. 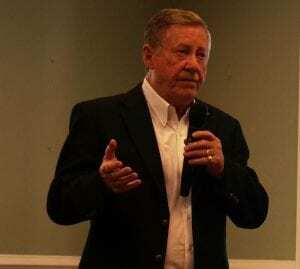 “Jerry” Tuso resigned from his position as chairman of the Gilmer County Republican Party. He tells FetchYourNews (FYN) he left the chairman position to run for the Post 2 position to be more hands on with the county in his service. 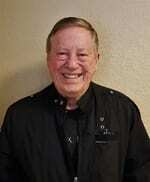 Previous to his time in Gilmer County, Tuso has spent a total 25 years as an air traffic controller. He had four years with the position in the United States Air Force and 21 years in the position with the Federal Aviation Administration (FAA). He noted these positions when speaking to FYN about his choice to run for the Board of Commissioners. He said he is running because he wants to continue serving the community. Tuso also said he brings business experience to the position without currently having a business to divide his time between. His experience comes from attending Tarrent County Business School in Hurst, Texas, three years spent on the planning and zoning commission in Hurst, and 19 years in national contract negotiation for contractors dealing with the FAA. Tuso did note one change he wanted to bring to the Board of Commissioners being a change to the “part-time” status of the post commissioners. 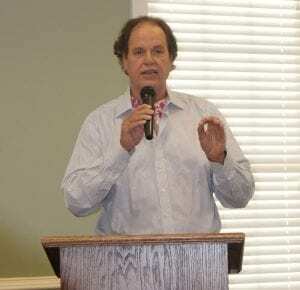 “In the last ten years, Gilmer County has almost doubled, and we’ve still got the old hat of part-time post commissioners,” said Tuso. He went on to note that the current commissioners spend upward of 30 hours a week on their positions through all they do. He also pointed out how large their binders are when the commissioners sit down to their monthly meetings. Tuso also noted the exemplary work that the current chairman and post commissioners have accomplished on the county, both financially and physically as the county is building on to itself. Tuso told FYN that is what he wants to focus his service on, sustainable growth in the county. 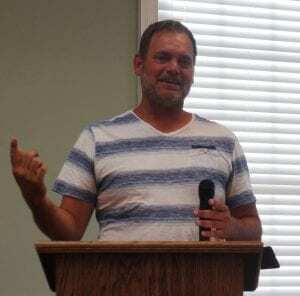 He noted the wineries as part of the agricultural growth the county has seen but with people continuing to want to live in Gilmer to commute elsewhere for work. His ideas of sustainable growth are what he wants to delve into at the position, if elected. Jerry Tuso is one of four candidates running for the Post 2 Commissioner position in Gilmer County. Check out FYN’s other candidate interviews as they become available for Woody Janssen, Karleen Ferguson, and Danny Hall. Next Article » Kemp tells the NRA they have been "Casey Cagled"
« Previous Article HOW CAN I QUIT PLAYING CHURCH?